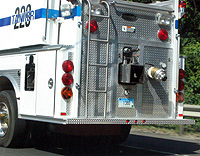 These plates are issued to firefighting-related vehicles upon request of a fire chief. They are used by volunteer, municipal, and corporate fire departments. Not all fire trucks use license plates in Connecticut. This type started around 1963, with white letters on a blue background, and a red decal strip across the top with the "FIRE APPARATUS" legend engraved into the plate. Eventually the plates used red letters on a white background. When the "blue fade" base was introduced, many of these plates were issued with blue numbers, such as the one in the photo to the left. I have no idea why. Red letters are once again the standard for this type. 'Vanities' are also becoming more common, with the unit number as the plate number: e.g. 'E-177' for Engine 177, 'S-213' for Willington's Service Vehicle 213, 'F-139' for Broad Brook's Forestry 139 Vehicle, and even 'RESQ-1' for Cheshire's Rescue 1.